An office complex in Amsterdam’s canal belt has sold for €142 million, reports the Parool. 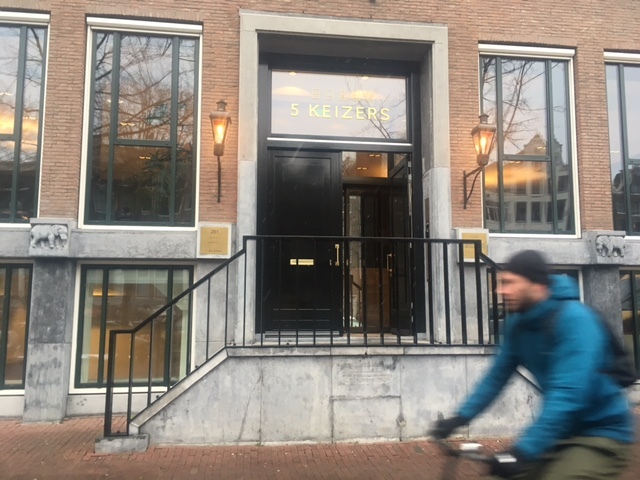 The ‘Vijf Keizers’, five buildings in the centre of the nine streets shopping area apparently increased in value by 75% in the past three years. It was bought in 2016 by the American company Marathon Asset Management for a price widely reported as €81.5 million, and has now been sold to Germany’s Union Investment. It was redeveloped in 2014, when it was owned by Credit Suisse and had a book value of €46 million, according to the Telegraaf. The set of buildings – which are not listed monuments – currently houses offices for Nyenrode University, H&M’s Benelux head office and the upmarket Marqt supermarket in its 15,000 sq m.
‘The Dutch property market is one of the most attractive in Europe at the moment,’ Martin Schellien of Union Invest reportedly told the Parool. The sale is a sign of the booming market, according to Reinier Wegman, from property agent Savills. ‘In the last 13 years, there have only been three office sales of this kind of value on the Amsterdam canals,’ he reportedly said to the Telegraaf. Office vacancy rates in the capital have dropped significantly in recent years, from 11.2% in 2016 to 4.6% at the end of 2018, according to the CBRE property consultancy. ‘We expect this rate to lower to 4% [by the] end of 2019,’ said Rineke Veenendaal, a spokeswoman. But concerns have been raised about the effects of property speculation on affordable housing. The city has pledged to build 7,500 new houses a year for those on ‘middle’ incomes and for social rental.